Did you know the designer behind the Oliver + S patterns also has a new line for women? I think the patterns are gorgeous. When I bought myself one today, I purchased an extra. 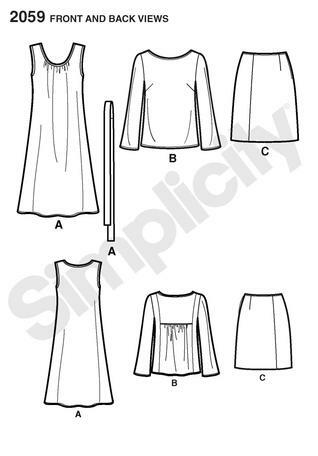 I'm giving away a copy of the Lisette series Continental Blouse, Dress and Skirt pattern in women's size 30" - 36" bust. (This is a paper pattern, not a pdf). To enter the giveaway, simply leave a comment below. Giveaway open to anyone, anywhere in the world. Please make sure you leave an email address if your profile doesn't link to yours. Giveaway closes September 15, 2011. The winner will be announced at the top of this post. I really like the new Lisette patterns. Thanks for sharing! So cute! I'd love to win - thanks so much! I have many to sew for- I need this! Thanks for the giveaway. Very cute pattern! Thanks for sharing! Looks like a super cute pattern! Hope you pick me! Oh super cute! I haven't seen this one yet! Would love to win one, and to see what you make as well! Thanks for bringing this to my attention! And also thanks for the giveaway! I remember seeing pics of the photo shoot and the final envelopes a while back. They are really lovely and perfect staples for anyone's wardrobe. oooo! that is so cute! i can't wait to see your version! lovely pattern! thanks for the chance. it's lovely. thanks for the giveaway! This is such a cute pattern!! Thanks for the give away! Wow - I didn't know these patterns were released already! They look great and if they're anything like the kids patterns will be fabulous fun to sew. OH!!! how fun, my Fabricland closed so I have no place to purchase patterns (but online). I have two Lisette patterns, but not that one. Great giveaway! I'm a devoted Oliver + S pattern lover, and I've been wanting to try one of the Lisette patterns! Thanks for the giveaway! awesome pattern! I hope to try it! sounds great. i'd love to try it. I'd love to try it. I need to use patterns more... how generous of you to have a giveaway! I'd love a great skirt pattern like this one!! I'm so happy to have just stumbled upon your blog today! I was looking for a tute on ruffle pants, and found yours. What an awesome giveaway. LOVE the lisette patterns! I've bought a few, but haven't tried them out yet...did you know they make the fabric prints used on the envelope as well?? Fantastic Pattern! Thank you so much for the giveaway! you R so kind....and i would love to dedicate some time for moi...if only i was a size 30-36!!! but God gave me melons not peaches!!! Beautiful patterns! I may just have to take up sewing for people taller than 3 feet! would love this pattern. Thanks for the give away! Fabulous! Now if only I could finish the portfolio dress I started in April! I love the model's outfit on the pattern!! If I don't win, I'm off to find some Lisette patterns of my own! Too cute! Very cute! I love the skirt on the model! Never heard of Lisette but I will keep my eye out for more! This pattern just looks gorgeous - so far I have only sewn clothes for my little boys, never something for myself - like many mums as I have just realised! Mums should care a little more for themselves - hm? OMG I too love sewing! I have made a few things at home, but I mostly look at things on the internet and don't use any patterns which means I mess up many times before I get it right. It will be lovely to get one!